april is autism awareness month! each year i do something a little different to celebrate the month. i've worn blue everyday of the month, gotten my co-workers to wear blue tutus, hosted blue polish nail swaps among other things. 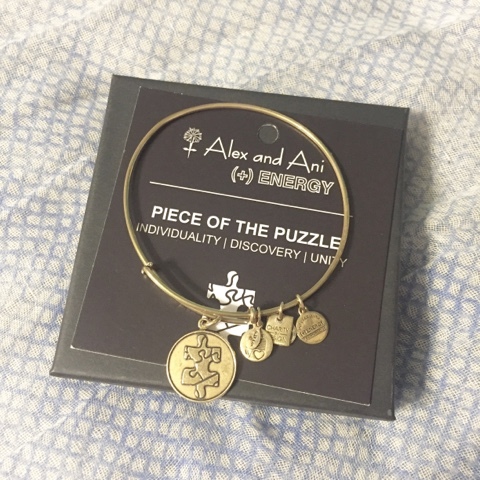 this year i am wearing my puzzle piece alex and ani bracelet everyday to remind me and everyone else that autism is everyday. sensitivity to light, sound, touch, etc. the things about autism is everyone is different. it is called a spectrum disorder because that is exactly what it is. everyone has their story with autism, and every story is a little different. my story about autism started when i was a kid. my cousin was diagnosed with autism when he was 3. we lived clear across the country from them so i did not actually see much of it or know much about it. all i knew was that he didn't talk as well as other kids his age. fast forward a lot of years until i was almost done with college. i worked at the library part time. i wasn't looking for another job, but for some reason i looked at the job ads in the paper. yes newspaper-i'm older than i look. there was a post for an in home therapist for a child with autism. for some reason i called, had an interview, accepted the job, started working with children with autism, and my life changed forever. i ended up working with several kids with autism during and the year after college. i loved it so much, and it led me to my current job. my story with autism doesn't end there. that's really only the beginning. i have the opportunity to work with many children with autism and their families. i see the challenges and the accomplishments, the tears and the laughs and most of all the love. my life has been so richly blessed by all the people i have worked with and continue to work with. if you have concerns for your child or someone you know, go to autism speaks for more information. everyone has a story with autism. tell me yours. I love how you are are showcasing the fact that autism is an every day struggle and not just something to be highlighted in a particular month! My six year old daughter has autism. The work you do is so important! You are truly making a difference in people's lives. Thank you for working with kids with autism!